19F 100% 19F is stable with 10 neutrons. Fluorine is a chemical element known by the chemical symbol F. It is classified as a halogen in the periodic table. 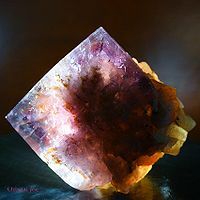 It is perhaps best known as the most electronegative element, which as a result will readily react with other elements to form various compounds. The acid states of the element are quite dangerous and chemists must treat work containing fluorine very carefully. 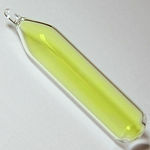 The element is quite useful to the human population and is used in a variety of ways. Most people will be familiar with fluoride. 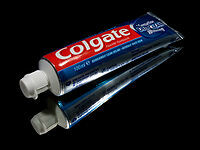 The chemical is added to dental products like toothpaste and mouthwash to prevent tooth decay. In many areas, including the US, water goes through a fluoridation process which adds the chemical to drinking water. A tube of toothpaste containing fluoride. A chart showing average floridation levels in water in US counties. ↑ Jaccaud, M., Faron, R., Devilliers, D. and Romano, R. 2000. Fluorine. Ullmann's Encyclopedia of Industrial Chemistry. ↑ 3.0 3.1 Helmenstine, Anne Marie, Ph.D. Fluorine Facts. about.com. Web. access Nov 27, 2012. ↑ . Community Water Fluoridation. cdc.com. Web. October 31, 2012. ↑ Stewart, Doug. 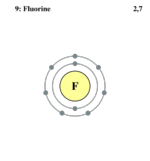 Fluorine-Element-Facts Chemicool. Web. 12/11/2012. This page was last modified on 25 January 2013, at 09:05.